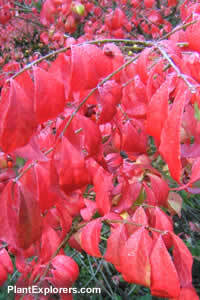 An attractive deciduous shrub in the spring and summer, Euonymus alatus turns a brilliant scarlet red in the autumn. When the leaves fall away, the winged branches add a subtle touch to the winter garden. 8 to 10 feet tall and wide. For maximum freshness, please keep the seed refrigerated in its original packaging until it is time to plant. Sow seed in containers in autumn to spring in a cold frame. If planting in the mid to late spring, stratify the peeled seed by refrigerating the pots for 4-6 weeks. Grow in any well-drained soil in full sun or light shade.